Jesus Christ Superstar season extended to 23rd September 2017. Final chance for audiences to see the production in its original home. Regent’s Park Open Air Theatre’s production of Tim Rice and Andrew Lloyd Webber’s Jesus Christ Superstar is now playing until 23 September 2017. 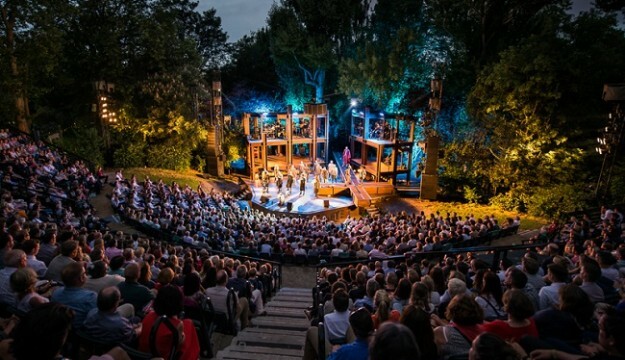 The production returned to the Open Air Theatre following a sell-out run in 2016, with critics proclaiming it “adrenaline-pumping” (The New York Times), “a gorgeous, thrilling, heavenly musical” (The Guardian), “vivid and compelling” (Evening Standard), “an almighty revelation” (Daily Telegraph). Directed by Timothy Sheader, the production won the 2016 Evening Standard Award for Best Musical, and the 2017 Olivier Award for Best Musical Revival, with the Open Air Theatre announced as ‘London Theatre of the Year’ in The Stage Awards 2017. Tyrone Huntley who reprises his role as Judas this year, also won the Evening Standard Award for Emerging Talent, and was nominated as Best Actor in a Musical in the Olivier Awards. The production also picked up Olivier Award nominations for Best Lighting, Best Sound, Outstanding Achievement in Music, and Best Theatre Choreography for Drew McOnie, whose next project is as Director and Choreographer of King Kong on Broadway. This is the UK’s first outdoor production of Jesus Christ Superstar, and 2017 also marks the 45th anniversary of the show first opening in the West End. In April 2018, the production opens at the Lyric Opera of Chicago, USA. *Lines open from 9am – 9pm. £1.50 per ticket telephone booking fee applies. Calls cost 7p per minute plus your telephone company’s access charge.